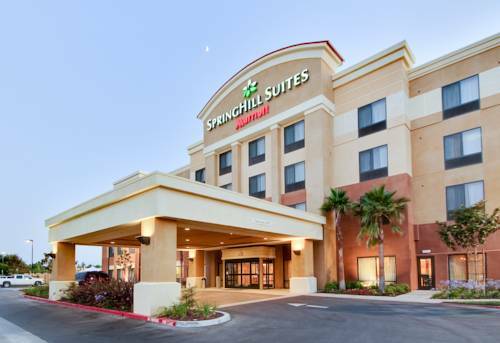 Travelers looking for all-suite hotels in Fresno, CA will appreciate the SpringHill Suites Fresno hotel for our ideal location near Fresno Yosemite International Airport and our new multi-million-dollar renovation improvements. Our hotel is a convenient over-night stop on the way to Yosemite, Kings Canyon, or Sequoia National Parks. We are less than 5-minutes from more than 30 restaurants at River Park Mall, convenient for visits to Woodward Park and Fresno State. We offer our guests complimentary: hotel-wide WiFi, a hot breakfast buffet, and parking. Unwind after a busy day in our Fresno hotels spacious studio suites and relax on the plush Marriott bedding or stretch out in the separate living room area offering a sofa and work desk, a wet bar with a mini-fridge and microwave, and a large swivel-stand HDTV. Guests enjoy 24-hour access to our onsite fitness center as well as the business center, the outdoor pool and hot tub, and our meeting spaces.